Very simple, but charming despite of, or actually because of that: the pallet bench/tablöe combination i saw outside Wuppertals Utopiastadt (“Utopia Town”, link in german), an alternative work/life area in an abandoned railway station. The palette bench is composed with (well, many) plain and simple stacked pallets, so is the table – two pallets of a somehow unfamiliar variety (they remind me of the U.S. pallet with continuous surface planks seen here). 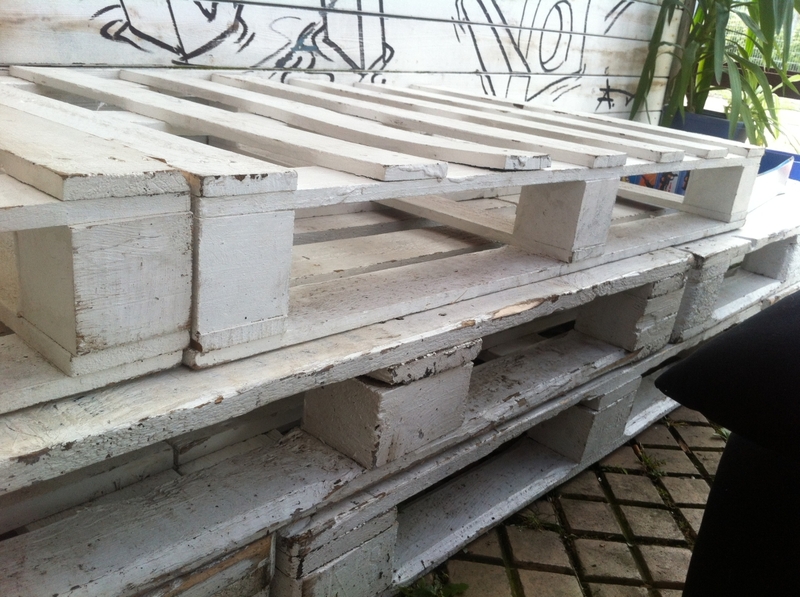 In detail: I do not know how the pallets are connected to each other. My guess wolud be the useage of long wood screws through an entire pallet into the piece below. Based on the observation that none of the “impriovized skewed screwings” was to be seen. Material: the seven palettes of the lower and middle layer seem to be standard euro pallets throughoutly. 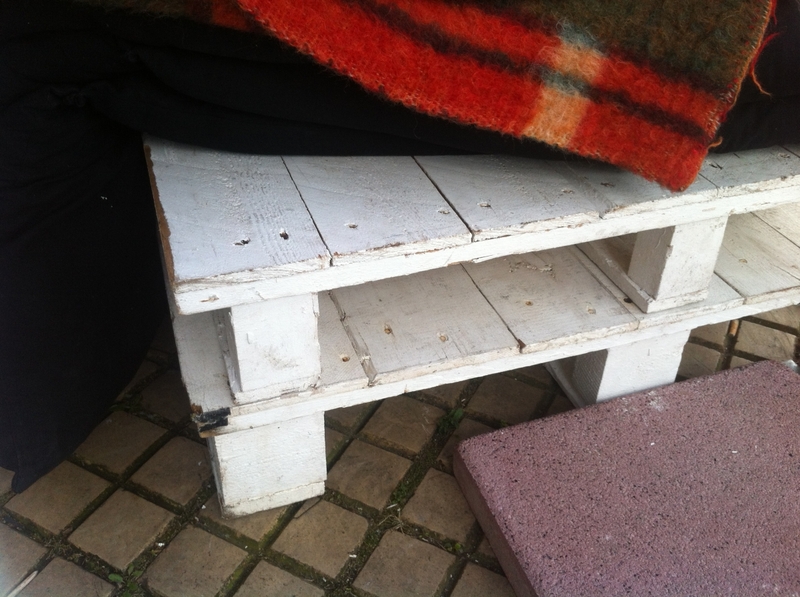 The top layer consists of two disposeable pallets, adding up to a total of nine pallets, making the bench quite stable and solid, nevertheless an installation not to be moved esasily after assembly. The painting/varnishing … well, being quite worn out my guess is that simple wall color was used, being not too robust in outdoor use. I don’t know if it was intended – the worn out look is totally likeable. 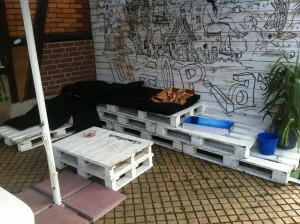 After all, the “seat pallets” gets covered with cushions before use, so theres no need to worry about paint scaling off. (CDushioning was the case here, too – the pillows were initially stored under an umbrella on the table, the weather did not seem quite reliable when i arrived) . I like it. Just because its kept relatively simple. Great for outside use and, like here, for the outdoor area of an alternative restaurant. For inside use, it maybe acts to much as a “dust catcher”, one of the reasons i don’t really like the plain “pure pallet stack ” creations indoor, for the said reasons not being able to clean them easily underneath and in between pallets. If you lack a back wall acting as a bacrest as it is the case here, you can of course mount a pallet sofa backrest as demonstrated here. 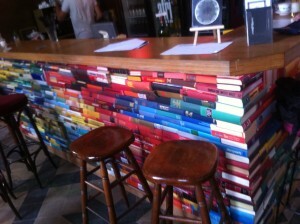 Offtopic/not pallet related furniture stuff i need to show off here: they built a book bar inside. 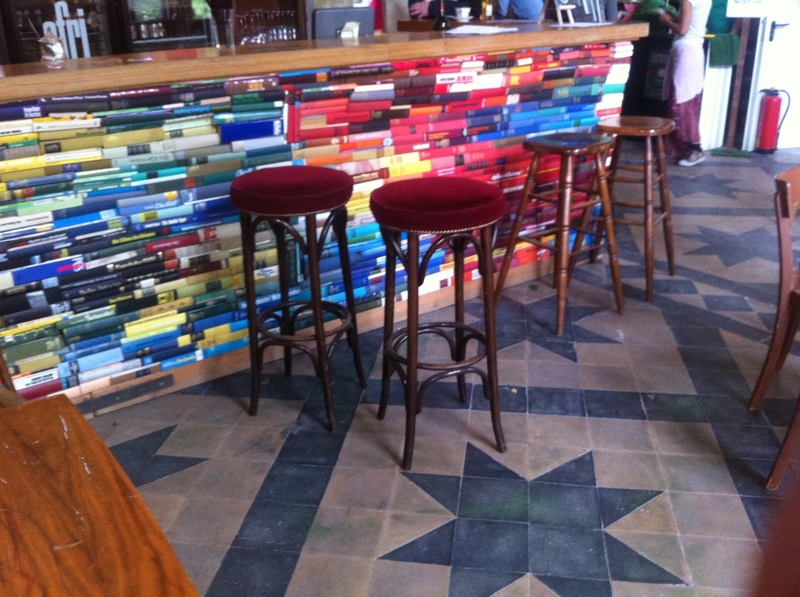 Also DIY furniture and sometzhing i really love, combining a love for books with a love for selfmade upcycling furniture, nevertheless, its somehow ambivalent, while books usually should be read. Nevertheless, i loved it and the used books looked not too important to me. Besides, some of them were loose (i don’t know if intended or by accident, though). 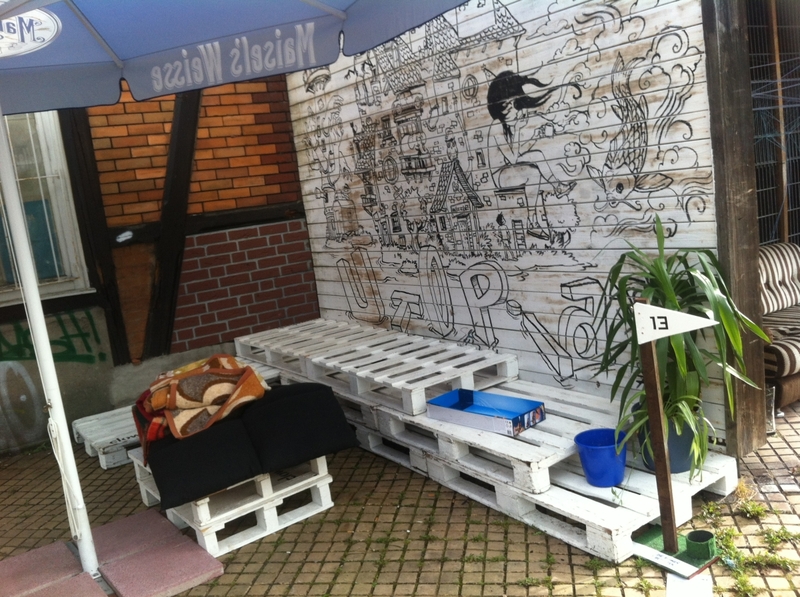 If you browse the picture galleries of the ceration of Utopiastadt, you can get a glimpse on the creation process of the book bar counter (link in german). 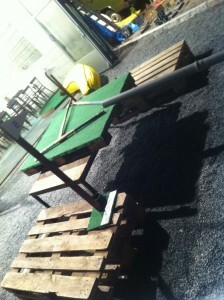 Last offtopic topic: at Utopiastadt, recently the third edition of Supagolf took place: a mini-golf art installation that was aas well like- as playable. 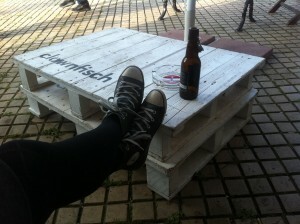 I had quite some fun there as shown here (link in german). I did not mention over there that the pinball/airguitar-mini golf track was created with pallets as base structure – in retrospect I am surprised that there were not more pallets used, but I think tzhey used pallets really only on this one from 18 minigolf tracks. Creating – in addition to furniture – also a little art and beauty with pallets, well, it seems like a Good Thing(tm) to me. Hi people! How are you? I’m Andy, from Argentina. I really loved the picture of the bar made of books. It’s perfect for a project I’m developing. 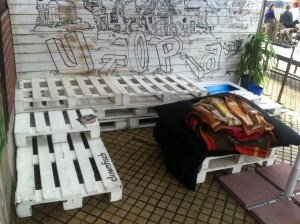 Can you upload it in my website http://www.proyectore.net?